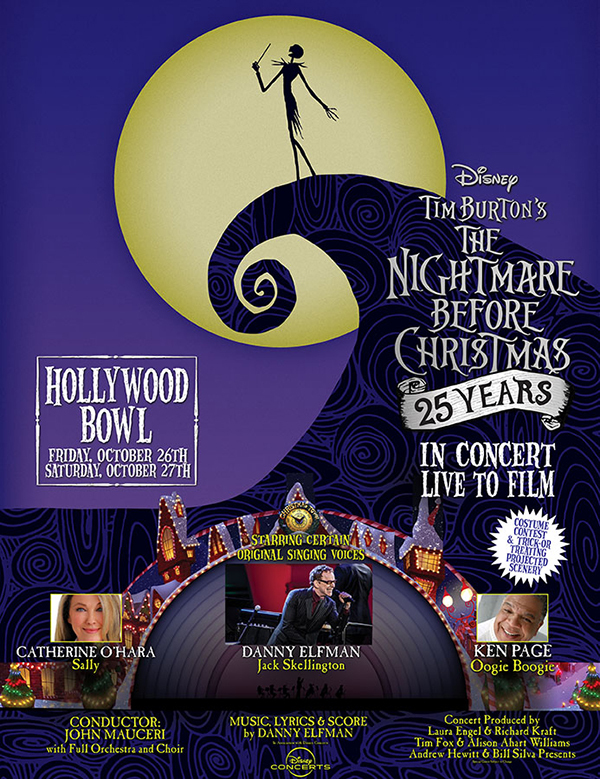 Los Angeles' reigning Pumpkin King, Danny Elfman, will return to the Hollywood Bowl on Friday and Saturday, October 26 & 27 at 8:00 pm performing his role of Jack Skellington singing live to film for a very special screening of Disney's timeless holiday classic, Tim Burton’s “The Nightmare Before Christmas" for the film’s 25th anniversary. The immersive experience will include live scenery projections, live orchestra, spectacular guest artists, and an all-star cast. Elfman will be joined by other original cast members including Catherine O'Hara (Sally) and Ken Page (Oogie Boogie) who headlined the opening production, which sold out two nights over Halloween weekend at the Hollywood Bowl in 2015 and returned for 3 nights in 2016 due to overwhelming demand. Tickets go on sale Saturday, September 8 at 10:00 am via all Ticketmaster outlets with a special American Express presale starting September 5 at 10:00 am and ending September 7 at 10:00pm. To purchase by phone call (800) 745-3000 or online at https://www.ticketmaster.com/venueartist/90150/2541294. The concert is produced by Laura Engel & Richard Kraft, Tim Fox & Alison Ahart Williams, and Live Nation/Andrew Hewitt & Bill Silva Presents, in association with Disney Concerts, the team behind several highly acclaimed live to film events at the Hollywood Bowl including Disney's Beauty and the Beast in Concert starring Zooey Deschanel and Kelsey Grammer as well as Disney's The Little Mermaid in Concert starring Sara Bareilles and Rebel Wilson. Conductor John Mauceri, founding Director of the Hollywood Bowl Orchestra, will once again be leading the full orchestra and choir performing the film’s classic score and cherished songs live to picture along with the all-star cast and special guest artists performing the film's acclaimed songs live. Through the magic of projection mapping, the award-winning creative studio Mousetrappe will return to create breathtaking living scenery projected onto the façade of the iconic Hollywood Bowl, making the event a constantly evolving extension of the film and music. This will be Mousetrappe’s second live to picture event at the Hollywood Bowl following Disney’s Beauty and the Beast in Concert earlier this year, which marked the first time that 90 minutes of original content had been created for video projection mapping on the surface of the iconic Los Angeles amphitheater. Concert producers Richard Kraft and Laura Engel explain, "We’re so thrilled to celebrate the 25th anniversary of the film with an extraordinary concert experience mixing film, live music, singers, and fully immersive digital projections that can only be experienced live.'" 2015’s Nightmare at the Bowl was named "#1 Concert of 2015" by the Orange County Register beating out such shows as The Foo Fighters, Janet Jackson, Garth Brooks, Shania Twain, Willie Nelson, Neil Young and The Rolling Stones. Halloween at the Bowl – Tim Burton’s “The Nightmare Before Christmas” – In Concert to Film will transform this legendary venue into Halloween Town with special pre-show activities including an audience participation costume contest, unique photo opportunities and trick-or-treating stations. Tim Burton-inspired costumes are encouraged. First released in 1993, Tim Burton's “The Nightmare Before Christmas” was directed by Henry Selick (“James and the Giant Peach”) and based on a story and characters by Tim Burton. The film follows the earnest-but-misguided adventures of Jack Skellington, Halloween Town's beloved Pumpkin King, as he attempts to take over the Christmas holiday. Against the advice of Sally, a lonely rag doll who has feelings for him, Jack enlists three mischievous trick-or-treaters - Lock, Shock, and Barrel - to help him kidnap Santa Claus. The film is rated "PG." Disney in Concert’s Tim Burton’s “The Nightmare Before Christmas” is produced under license by Disney Concerts. Disney Concerts produces concerts and tours, and licenses Disney music and visual content to symphony orchestras and presenters on a worldwide basis. Disney Concerts' concert packages include a variety of formats such as "live to picture" film concerts as well as themed instrumental and vocal compilation concerts, ranging from instrumental-only symphonic performances to multimedia productions featuring live vocalists and choir. Current titles include the Star Wars Film Concert Series (Episodes IV-VII), Beauty and the Beast, The Little Mermaid, Fantasia, Pixar In Concert, The Nightmare Before Christmas, Alice In Wonderland, Frozen, Ratatouille, The Pirates of the Caribbean series (Episodes I-IV), and Silly Symphonies, which last year collectively accounted for over 400 performances in many of the world's top concert venues, including Lincoln Center, Royal Albert Hall, Sydney Opera House, Tokyo Forum, and the Hollywood Bowl. Numerous new concert packages and touring productions from Disney's portfolio of studios, including Disney's feature animation and live action studios, Pixar, Lucasfilm, and Marvel, are currently in development.